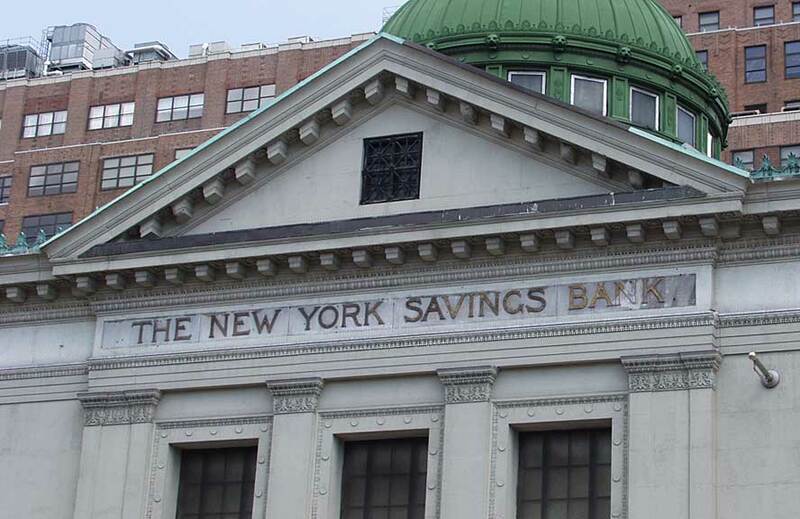 The New York Savings Bank was founded in 1854 as the Rose Hill Savings Bank and changed its name to New York Savings 1 Jan. 1862. The bank occupied this corner of 14th St. and 8th Ave. consistently throughout its entire lifetime (until 1963 when they acquired the Bank for Savings in the City of New York, and the merged banks changed their name to the New York Bank for Savings). The Bank for Savings is also featured on this web site at Fourth Ave. and 22nd St. Designed by the architect, Robert Henderson Robertson (1849-1919), the present building dates from 1896-97. It is "faced entirely in Vermont marble" and "is crowned by a commanding copper dome with a clerestory of twenty stained-glass windows" (quoting Guide to New York City Landmarks, text by Andrew S. Dolkart and Matthew A. Postal, 3d ed. 2004). R. H. Robertson is perhaps best represented in New York architecture by the Park Row Building (15 Park Row, facing City Hall Park) constructed 1896-1899. The Park Row Building was the world's tallest structure (30 floors) from 1899 to 1908. More on the Park Row Building and R. H. Robertson can be found at nyc-architecture.com. Another Robertson building with signs featured on 14to42.net is the American Woolen Building on 19th St.